With warmer weather comes a craving for lighter meals. Longer days and sunnier skies also signal baseball season in our house, which means I need dinners that are quick and easy. This recipe checks both of those requirements off of my list. If I am being completely honest, quinoa isn’t a kid favorite in my house, but my three will happily eat it if there is homemade flat bread, olives, and cheese involved. I also find that with pretty much any meal, my kids will buy into it more if they help me cook. My three year old assisted me when I last made this greek quinoa salad for dinner and munched on veggies while we cooked. She even tried a raw red onion, but promptly spit it out exclaiming “it tastes like rotten eggs!” randomly followed by “I’d rather eat bacon!” At least she is open to trying new foods, right? I do most of my grocery shopping at Costco, Trader Joe’s and New Seasons, which is a local chain that is similar to Whole Foods, but smaller. I love that this recipe is full of fresh, healthy ingredients that you can find in any grocery store! The recipe calls for Persian Cucumbers, but if you can’t find them, an English cucumber works fine as well. English cucumbers are generally sweeter than regular ones, and the seeds are much smaller. If all you have on hand is a regular cucumber, you could use that as well, just be aware that it has larger seeds. A few quick tips to help you successfully master this meal! Rinse the quinoa under cold water for at least 30 seconds using a fine mesh strainer. Drain well. Rinsing removes quinoa’s natural coating, which may cause it to taste bitter. After doing some research, I recently switched up my method of cooking quinoa. I used to cover the quinoa while cooking, but found that it often ended up a little mushy. Cooking uncovered and then steaming seems to resolve that issue. If red onions are too strong for you, submerge the chopped red onions in cold water for about ten minutes to lessen the bite. Drain before adding to the salad. 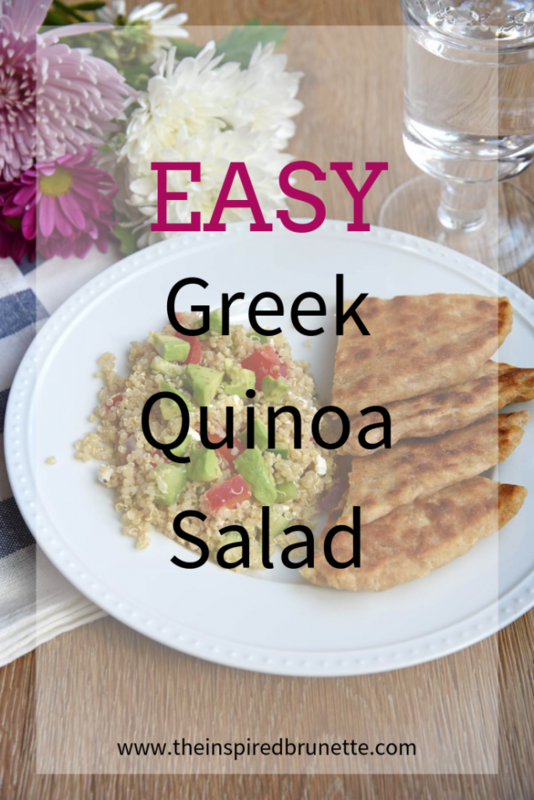 Homemade flat bread is a delicious accompaniment to this greek quinoa salad. If you don’t have the time or the desire to make flat bread, you can substitute any store bought pita or flat bread. If I have extra time I will also make Tzatziki sauce for dipping. 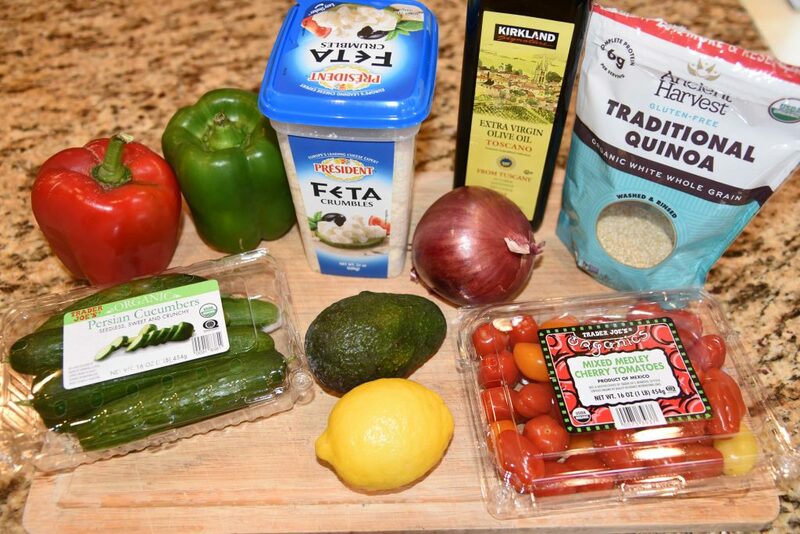 While it has a few more additives than I typically like, Trader Joe’s makes a pretty good Tzatziki sauce that I use if I am limited on time. I find that I am much more successful at putting healthy meals on the table during the week if I plan ahead. 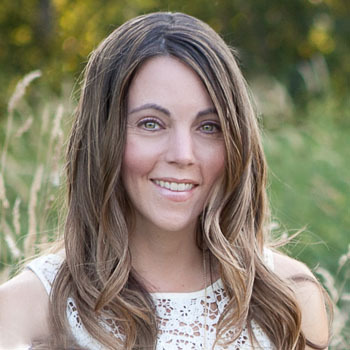 If you are looking for a little meal planning inspiration, take a look at my Meal Planning 101: Ultimate Tips For Busy Moms. 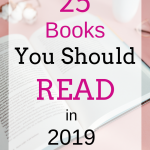 This will help you get started on that path. 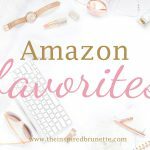 Trust me, it has been a big game changer to have meals planned out and organized each week! 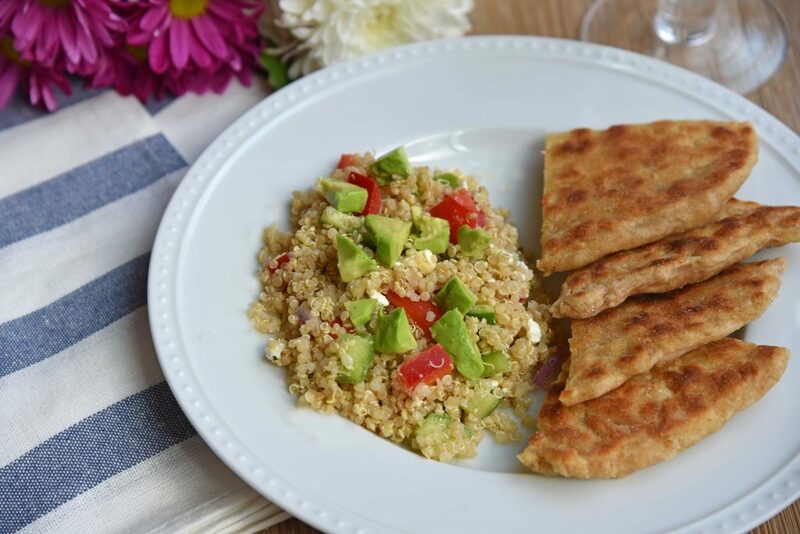 Do you have a favorite receipe using quinoa? I’m always looking for new ways to serve this healthy grain! Rinse the quinoa under cold water for at least 30 seconds using a fine mesh strainer. Drain well. Combine the rinsed quinoa and water in a saucepan. Bring to a boil and decrease heat to maintain a gentle simmer. Cook uncovered until all of the water is absorbed, about 15 minutes. Remove the pan from heat, cover, and steam the quinoa for about 5 minutes. Remove the lid and fluff the quinoa with a fork. While the quinoa is cooking, dice the peppers, cucumbers, cherry tomatoes, and red onion. You can submerge the chopped red onions in cold water for about ten minutes to lessen the bite. Drain before adding to the salad. Next, whisk all ingredients for the dressing together and set aside. 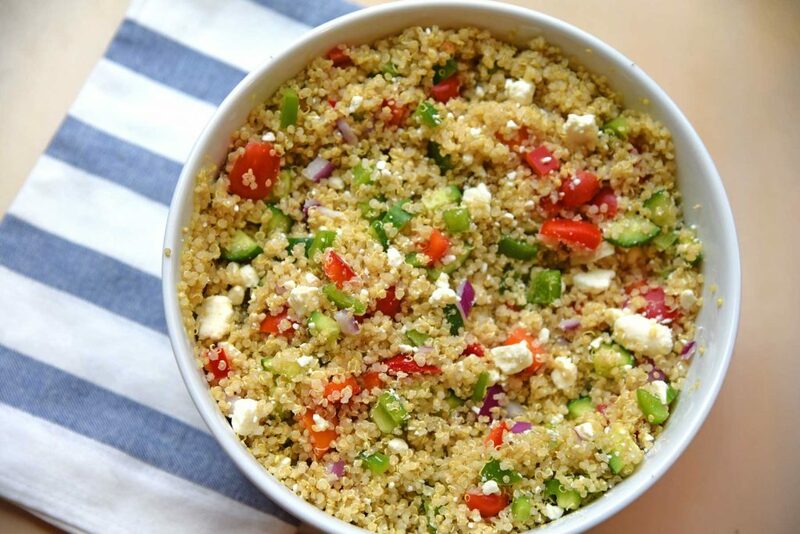 For a chilled salad place the quinoa in the refrigerator before mixing in the veggies and feta. You can also serve this salad at room temperature, but be sure to add the feta once the quinoa is fairly cool so the cheese doesn't melt. Pour the dressing over the salad, toss and serve. Top with sliced avocados or olives and add additional salt and pepper to your liking. Jessica, what a delicious-looking recipe! 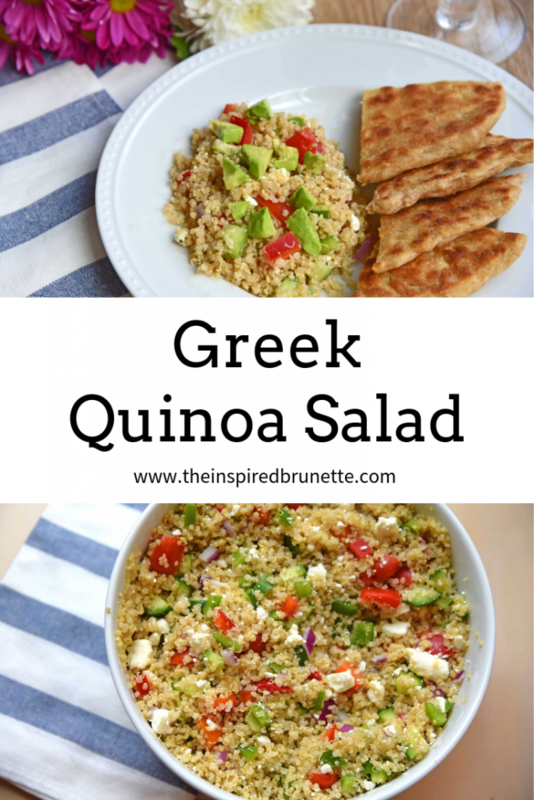 So light and fresh…and anything with feta is a winner in my book! Thanks for sharing! You are very welcome Cayla! We are fans of feta around here too! yum this looks delicious! anything greek has my name written all over it. I am so obsessed with quinoa, and these flavours would work so well with it – can’t wait to make soon. Yum! 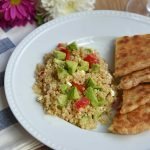 I love quinoa and I’m always looking for new ways to use it! As a Greek I obviously love greek salad lol so this is perfect! Ohhhhhh I love quinoa and I love Greek food. OMG this is amazing and now I HAVE to try it.